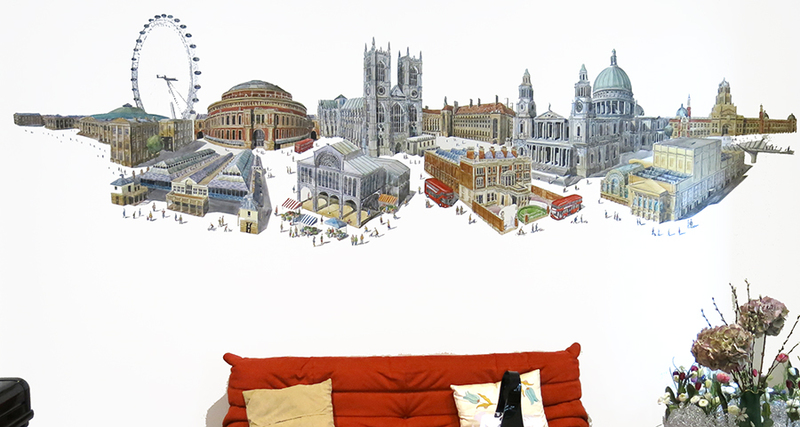 A 4.2 meter mural of London's architecture painted on an apartment wall. I have been painting London’s architecture for many years now. I have always enjoyed running about the metropolis, noting its eclectic and often eccentric buildings, so I was most intrigued when a client called me up to commission a very large mural of London buildings for her apartment. I have never done a mural before, so I confess I was a mite nervous at first. That said, I do enjoy a challenge. 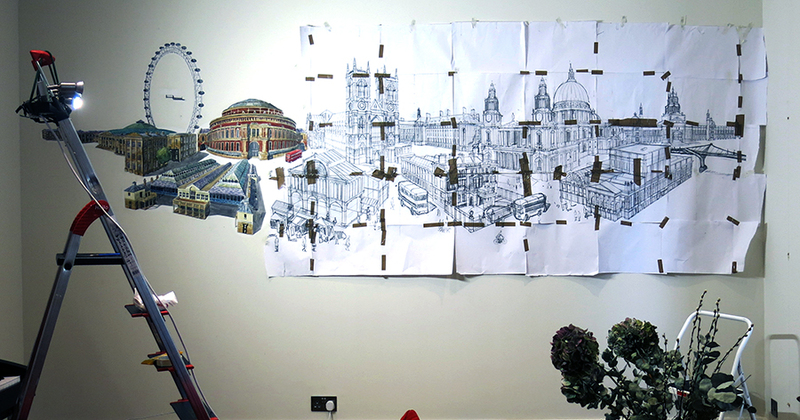 The client wanted the mural to feature buildings in London that meant something special to her. Great food in Borough market, art in Manchester House, and so on. Although this was a montage of many different buildings around London, I still wanted it to have some sort of cohesive feel for it to work as A single image. I decided to solve this problem by having all the structures sitting within the same plain of perspective. 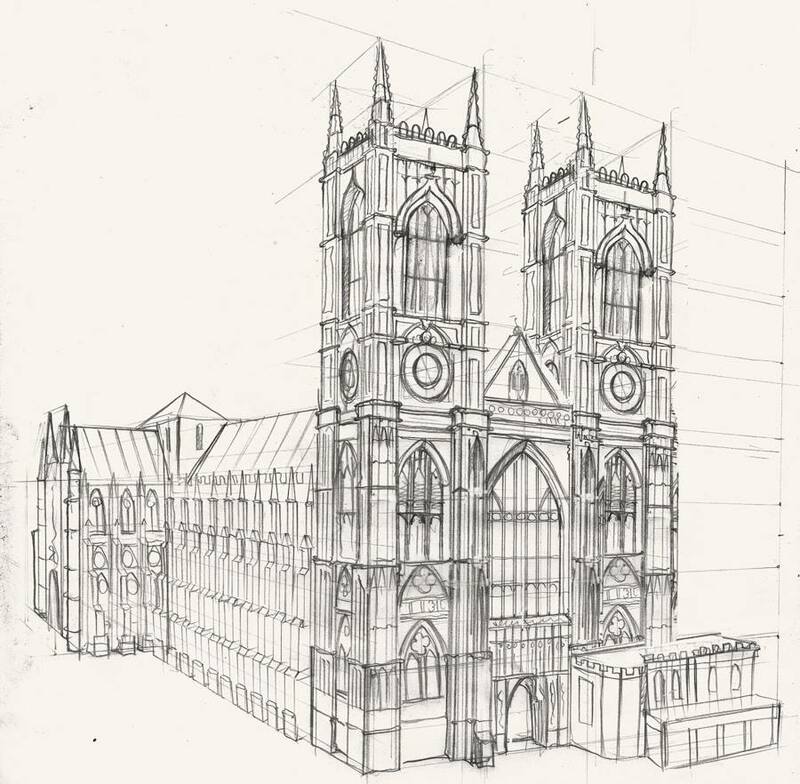 I also chose to have the scale broadly correct, meaning that the larger buildings would be at the back, then as it moved forward, the more modest sizes in front. I always believe in bringing your skills to the idea, not just working within safe zones. The challenge here, however, was that I could not just go out and draw them all from the street or a photograph, as they simply would not work on a single perspective. Added to that, some buildings needed to be drawn from above. After a bit of thought, I trawled through Google images for all the relevant buildings to build a small library of reference. From there, I utilised Google 3d Satellite feature. With this I could swing about to pick a decent angle which looked about right compared to the rough visual I produced. I couldn’t just print it out then trace it off as my work has an idiosyncratic style to it, and tracing it off would make it all look stale. So I sketched off each chosen building in pencil whilst looking at the screen. The more detailed elements I filled in using my photo reference. 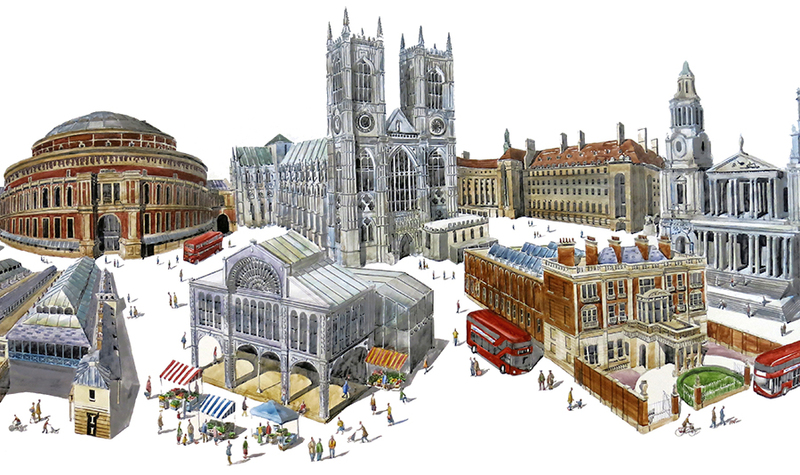 Once all the buildings were drawn, I pulled them together digitally as a single image then printed it out very large on multiple sheets of A3 paper, finally taping it altogether to make the 4.2 meter wide scene. In the apartment, I sanded, and degreased the wall first, then applied gesso as my painting surface. From there, I traced down the first few buildings. It was odd working on a ladder with a totally vertical surface. I got a feeling of how those artists in the old days painted frescoes. It’s not easy. Once the pencil was down, I pulled in the tonal values to get an idea of where I was going. From there I washed over the colours. Lastly, I added the ubiquitous figures that always make their way into my work. That’s my favourite bit! As I was working, I was so glad of all the meticulous preparation I did first. It really paid off as all the decisions had already been made once it came to the final piece. I knew exactly what I needed to do even before I stepped onto the ladder. Once it was done, the client (thankfully) and I were pretty pleased with how it all went. 4.2 meters is the largest thing I have ever painted ! A real challenge, especially as it has all the detail of my normal work. A tough but very rewarding challenge. I offered the client the option to put it all on canvas as they wanted it directly onto the wall. A bit of a challenge but we got there in the end.